We think it’s important that you know who is going to be by your side as you learn to drive before they arrive to take you out on your first lesson. So without further ado, please allow us to introduce our fabulous team of driving instructors! Each and every one of our instructors is driven by your success and committed to helping you pass your test. They are fully trained and accredited, as well as regularly attending refresher courses to keep up to date with evolving exam content, legal requirements and safety conditions. Each member of our driving school operates in a slightly different area – you can see where each instructor covers below. When you’re ready to book, simply call us on 0161 327 2105 to book your first lesson with your chosen instructor! Hi I’m Geoff Capes – owner of the driving school. I’ve got almost 20 years’ experience under my belt as a driving instructor, as well as running courses and training for newly qualified instructors and seasoned professionals alike. I’m passionate about the industry, and I’m even more passionate about helping you to pass your driving test! I offer driving lessons in a manual vehicle, but I also carry out lessons in our automatic car. I cover most of the South Manchester area. Andy is one of our most experienced driving instructors – he has been an ADI (Advanced Driving Instructor) for 11 years. In a previous life, Andy was a chef – but when he got fed up with that, he decided to take a completely new direction with his career and trained to become a driving instructor. Andy loves meeting new people and helping them to achieve independence through passing their driving test. In his spare time, he loves fishing and Manchester United. Andy carries out his lessons in a manual car and covers Macclesfield and all other nearby areas. 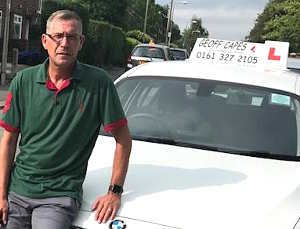 Ian Hill conducts our automatic driving lessons all around South Manchester in his shiny new BMW automatic car. He has plenty of experience as a driving instructor – qualifying as an ADI in 2000. Before that, Ian has had a varied career which includes running pubs, working as a plasterer and even driving buses. Despite a diverse collection of past occupations, Ian has always wanted to be a teacher – he loves imparting his knowledge to the next generation of drivers and enjoys the challenges he often faces as part of the job. If Ian won the lottery, he would buy an Aston Martin and teach in that (fingers crossed!). He would also love to go to Las Vegas and play poker in the WSOP. Stephen mainly covers Tameside and the High Peak district in his manual white Ford Fiesta. Stephen is another of our experienced driving instructors – qualifying as an ADI in March 2007. Previously he worked as a Lab Technician at Louvolite, a window blind manufacturer. He has always wanted to become an ADI – so when he finally got the opportunity having been made redundant from his 9-5, he took it with both hands and has never looked back. He really enjoys his role as ADI as no two days are ever the same. Most of all he loves the feeling he gets when students pass their test! Stephen is married with two daughters and in his spare time, he loves to spend time with them. He is also a season ticket holder at Manchester United – so he loves going to games or watching them down at the pub with his mates. Amanda has a wealth of experience as a driving instructor, having worked in the industry for 11 years. When Amanda is not helping people to pass their driving test, she likes camping, hiking, dining out and listening to music. Amanda’s biggest thrill is seeing the sheer delight on the face of a pupil who has just passed their test, something which she finds thoroughly rewarding and wouldn’t be without. You can see Amanda in her brand new Mazda travelling around the streets of Macclesfield. Paul mainly covers Stockport and surrounding districts. Paul why did you decide to become a driving instructor? My Daughter was learning to drive she had a few problems and I helped her to overcome those issues and realised I was calm, relaxed able to help and good at it. so, I thought why not have a career change 2 ½ years later here I am. What did you do before becoming a driving instructor? I was a Car mechanic, worked for a few main dealers then ran my own successful mobile mechanic business. What do you like about being a driving instructor? I enjoy the teaching, sharing my knowledge not just so people can pass their test but to drive safely, courteously until they are too old to drive. What car do you do you teach in? I decided to pursue a career as a driving instructor as a result of some advice from a friend who has been in the business for over a decade. The idea of helping people learn what now is deemed to be a necessary life skill seemed to fit in with my ethos of helping others to achieve their full potential. Before becoming a driving instructor I spent 12 years in the British Army as a soldier in the Corps of Royal Engineers, Serving in Germany, Kenya, different locations in the UK and in Afghanistan. I then spent 18 months working for Cheshire Fire & Rescue Service as a member of their Prince’s Trust Team working with youngsters struggling to find employment and education. The job allows me to be flexible and choose my own working hours. It allows me to meet people from a variety of backgrounds and it also gives me the chance to take a break when I need to in order for me to deal with my disability. I currently teach in a White Toyota CH-R (Automatic) car. I am a keen follower of Liverpool Football Club and Jacksonville Jaguars an American football team. I have recently qualified as a diver after completing an adaptive scuba diving programme and enjoy getting in the water at every available opportunity. I spent the past 20 years as a class one truck driver which I loved, I had to take and pass a medical to continue that career, sadly I failed and I spent the next few years working for the same company as a shunt driver. That ended and I then worked for B&Q for a couple of years, it was fun but not challenging enough. My nephew was learning to drive around this time and I sat in on a few of his lessons, after chatting to his instructor and having a couple of meetings with a trainer I realised I had the skills and patience to try for myself. I’m so glad I did because now I do a job which I enjoy and feel useful. It’s so amazing to see people making progress and watching the joy when things suddenly click resulting in a rewarding lesson for the person learning. On the day of the driving test when someone passes well that’s great knowing where we started to have this result. I feel honoured to share that moment in a person’s life. I have a Ford Fiesta. I mostly like to walk my dog or spend time doing some kind of DIY project. Currently I’m converting a vehicle into a motorhome. I’m a big film fan and love traveling, I still keep my hand in at the truck firm I used to work at by occasionally doing the odd day for them.